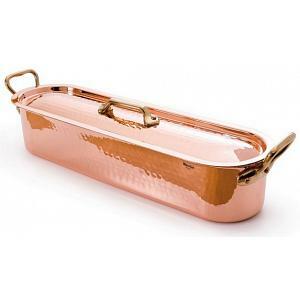 The stock pot from Mauviel's M'tradition collection is useful for anything from cooking stock, stewing tomatoes, cooking corn on the cob, and other bigger cooking jobs. The stock pot comes with a tightly fitted lid, ensuring water gets boiling faster and saving you lots of time cooking for your family. 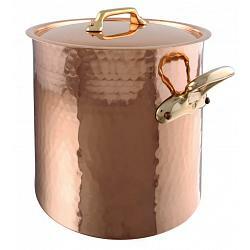 The Mauviel stock pot is made from copper with tin interiors. The tinning was done by traditional process and not by electrolytic deposit. 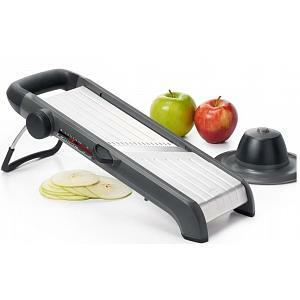 The stock features a beautiful hammered and polished finish on the outside. The three handles are made from bronze and are securely fixed by copper rivets. The stockpot can be used on gas, electric, and halogen cooking surfaces, and can be put in the oven. To make cleaning a breeze, it's dishwasher safe too! The pot stands 28cm / 11 inches tall and has a generous capacity of 17L / 18qt. The tinned copper is 2 - 3.5mm thick. The Mauviel stock pot is proudly made in France and has a lifetime warranty.